On Our Way To Ballet Class. I've been working on this one awhile. I had the background color and the buildings on the canvas for a while, at least four months. And then recently I started adding more and more.The mom's dress is paper I painted and so is the little girls top. The mom is beyond cool, her belt and the design on her purse are xmas lights. Space colored tights on the girl. One of the talking women has flowers as rollers in her hair. 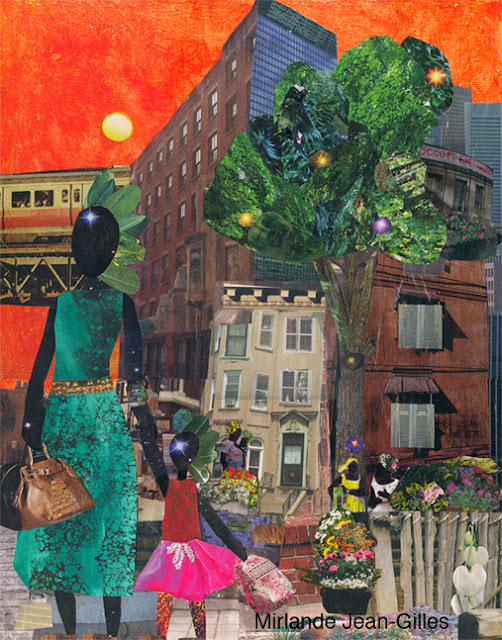 This collage reminds me of my childhood in Queens, we lived next door to the elevated number 7 train, that rumbled by every few minutes. There were women who watched over the neighborhood. Most of the buildings were six stories tall and the trees were old. It also reminds me of where I live now, it's citified but there is nature bursting everywhere! This is my latest collage. I found a perfect weighty piece of cardboard from some packaging and decided to make it beautiful. At first it was just the mountains and the sky. I am experimenting with these fun sky treatments. I felt like something was missing. So I added one girl and she had a different dress at first and then it seemed like she needed company so I gave her a sister. 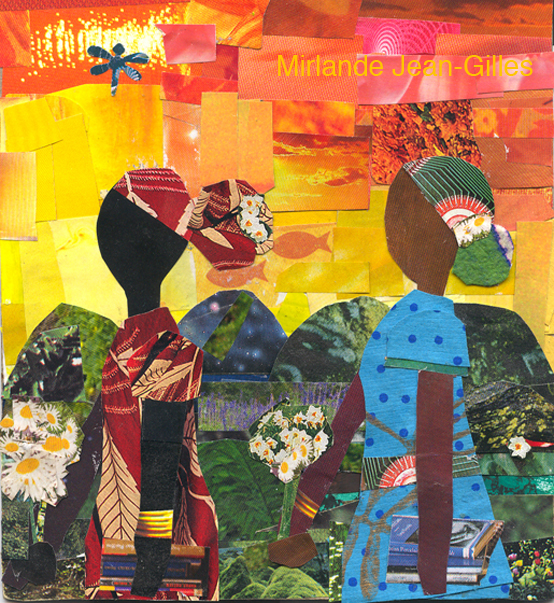 The girl in the blue dress, her head wrap is a microchip and so is her belt. The dress is made out of one of my favorite papers that I've saved for years! http://www.etsy.com/listing/108288957/sisters-carrying-books-and-flower Buy it on etsy!